October 15 is a few weeks away and many plan sponsors are working to complete their Form 5500. Large plans subject to Schedule C filing must obtain the fees for the service providers to their plan. Law changes in the past few years require plan sponsors to obtain and review the service provider fees for reasonableness. It’s no secret in the retirement industry that investment management and recordkeeping fees encompass the majority of a plan’s recurring fees. Registered Investment Advisors (RIAs) hired to direct a plan’s investment options are typically held to a fiduciary standard with respect to the plan’s assets. Furthermore, the RIA must demonstrate that their fees are reasonable. 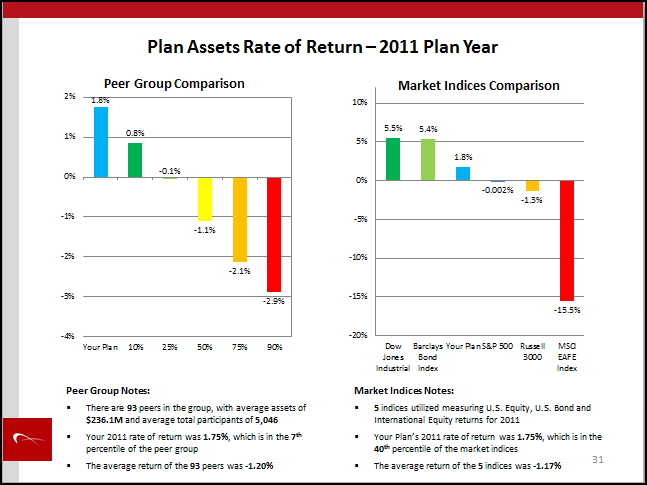 Investment returns vs. asset allocation compared with similarly sized defined benefit plans. Cost of actual fees compared with similarly sized defined benefit plans. An RIA can easily compare their investment returns to market indices (e.g. S&P 500, Dow Jones Industrial Average (DJIA) or Russell 3000). Similarly, it is easy for an RIA to provide the fees paid for their services. The difficulty arises in comparing the investment returns vs. asset allocation and fees paid with similarly sized defined benefit plans to ensure that the RIA is providing value to the plan sponsor and participants of the plan. Atéssa recognizes that defined benefit plan fees are often overlooked compared with defined contribution plans. In fact, there are very few service providers committed to benchmarking the plan fees and investment returns for similarly sized pension plans. Atéssa leverages data from the Department of Labor’s (DOL) EFAST2 Filing System to create custom benchmarking peer groups and reports. Atéssa’s database includes all plan filings for 2010-2012 with algorithms designed to select a benchmarking peer group of 20-80 similar plans for fee and investment return comparisons. Each peer group member is individually reviewed by an analyst to ensure it is a proper fit for the benchmarking group. Analysts typically review the accounting opinion to confirm certain plan criteria and ensure an “apples-to-apples” approach. Our final benchmarking reports are typically 20-25 pages and are customized to your needs. Bulk pricing is available. Please contact Mike Bourne at 858-673-3690 x109 or mbourne@atessabenefits.com to further discuss benchmarking your retirement plan. Atéssa is happy to provide a complimentary “total plan fee” estimate based on your plan’s publicly available fee disclosures on Form 5500.